I’ve been thinking about another mortise gauge since I completed the coffee table a few months ago. There is convenience and accuracy in being able to set a gauge to a specific setting and maintain that setting through several steps of a project. There is a certain inconvenience to this as well. You can’t use the gauge for anything else! Fortunately a box appeared on my doorstep the other day and there were several items inside. 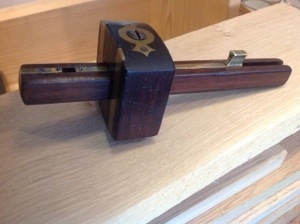 The first was this wonderful mortise gauge. I already have two marking gauges, the first is a Veritas wheel marking gauge. Obviously since it only has one marking cutter it is not designed for mortises (although you can use it that way with a loss of accuracy). I like the Veritas gauge ,it holds its setting and works well. 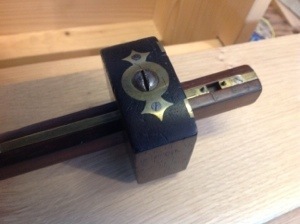 However it is not a mortise gauge. The second is a mortise gauge from Crown Tools. Say what you want about the quality of crown tools…but this gauge has worked well for me and the only real complaint I have is it’s comfort in the hand. The corners are square and dig into your hand. 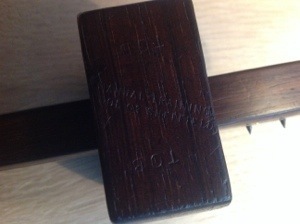 A closer look at this gauge and you can see that it is stamped with the words ” Manual Training Tool Co Sheffield”. There is also a stamp of TOB which i assume is an owners stamp. I dug around and discovered that the Manual Training Tool Co Sheffield may be the same as found in Sheffield England around 1890-1910. You can read a little about it yourself on the internet. More importantly to me is the feel of the tool. The edges are slightly rounded and it fits firmly in my hand with no awkward corners. The gauge moves with precision, the brass is practical, but gives it a classical look. This is what a mortise gauge should look and feel like and I am honored to give it a new home and put it to work. In this post I also wanted to make my English teacher (I’m sure she’ll never see this blog) proud by correctly using the term gauge not gage, two very distinct words! Do you need a screwdriver to secure the head once you it at what you want it to be? Where do I sign up to have one of those boxes appear on my doorstep? You can never have too many marking gauges! I’ve got the crown mortise gauge as well and also find the edges uncomfortable. I’m considering rounding them a bit, but need to have a good look and check this won’t effect it’s accuracy. At the moment I can’t see any harm in doing this though. Have you considered this?